A purely factual accounting of the world-famous Spurrier tasting that changed the world of wine forever. Taber was the only American journalist at the event. In actuality, Taber was the only journalist in attendance, period. The book is entertaining with a ton of great information about the “early” days in California fine wine making. The recently released Bottle Shock, is the theatrical take on the subject. A collection of articles written for Gourmet magazine going back to the 1940’s. All of the classic and pivotal wine writers are represented, from Frank Schoonmaker to Hugh Johnson. A wonderful collection of writing – it was amazing reading about a post-prohibition California wine industry desperately searching for a bright future, as well as a post-war Europe seeking the same. Enchanting and informative. An entertaining account of Doyle’s one year trip through the Willamette Valley in Oregon filled with a mix of history, comedy and reality. A short, easy read – the book will leave you smiling and wanting a glass of Oregon Pinot Noir! Brand new to the market, this book is a compilation of helpful advice from Alison Crowe, the Wine Wizard from WineMaker magazine. Very useful reference with information organized by parts of the wine making process. Well indexed. A must-have volume for the home winemaker. An excellent, revised edition by the founder and CEO of Cadenza Wines in Ontario, Canada and a regular contributor to WineMaker magazine. The book is chock full of valuable information for the home winemaker. Loads of detail organized by steps in the wine making process, making it very easy to locate content. Another must-have volume for the home winemaker. If you are seriously interested in understanding and learning about the origin of the great American cocktail, then this is the volume for you. Wondrich does yeoman’s work in dissecting and researching a panoply of mixed drinks. The book is essentially an expanded and annotated version of the well-worn How to Mix Drinks, or the Bon-Vivant’s Companion, published in 1862 by Jerry Thomas. One should not confuse this book with other mixed drink references, but instead one should view this as the starting point, or primer for any devoted mixologist. An interesting and fact-filled guide to wine, starting with the basics and moving right through avid collecting. A solid reference for managing a wine collection. The volume includes valuable information on selecting an appropriate cellar, whether home-built or ready-made, along with details on managing a modest-to-large wine collection. I have every book that Peter Mayle has ever written. I love his easygoing style, his dry wit and I'm envious of his life, despite some of its foibles. Mr. Mayle has written a series of books about his own experiences (A Year in Provence and Toujour Provence) living in the south of France and he has written a series of fictional novels that always revolve around wine, food, and usually southern France. A Good Year is his most recent effort and it is wonderful. More related to wine than his prior works, the story is intriguing, funny and leaves me longing to pack my bags and move to France. Perfect summer weight reading! Another entertaining romp through some of the most interesting wine making regions of the world. Once again, Mr. McInerney shares his experiences in the vineyard as contributing editor to House & Garden magazine. Funny and at the same time educational, a quick, must read. A wondrous autobiography about my favorite wine writer, written in the easy-going prose that has defined Mr. Johnson’s style for over forty years. The book is filled with entertaining stories and lovable vignettes, and the ever on-target wit and wisdom of one of the most influential wine writers of the 20th and 21st Centuries. Mr. Johnson is the only person that can chastise Robert Parker and get away with it. A wonderfully funny romp through the history of alcohol. A must read if you like trivia. Very light, but extremely enjoyable. A great compilation of articles featured in House & Garden magazine on wine. Mr. McInerney is a noted author and contributing editor to House & Garden, who writes amusing, informative vignettes about wine. I found the book highly entertaining, and usually in sync with my perspectives on wine. An interesting and often funny chronology of Mr. Osbourne's journey to discover the meaning of truly great tasting wine. The book finds Mr. Osbourne globe-trotting through the vineyards and wineries of the world, sipping, slurping and spitting in the name of good taste. Entertaining. Gerald Asher has been the Wine Editor for Gourmet Magazine for nearly 30 years. In that time, Mr. Asher has amassed a wonderful set of stories and anecdotes about wine, which have made there way into a number of books. This, his third installment, is a wonderfully entertaining collection of his latest adventures. Having enjoyed Mr. Asher’s latest book, The Pleasures of Wine, I sought out his first two works, each a compilation of his articles published in Gourmet Magazine. His first book, On Wine is unfortunately out of print but can be found at www.abebooks.com for short money. His second book, Vineyard Tales has recently been re-released. Both are wonderful books, written in Mr. Asher’s passionate and informative style. I loved reading both these books, somewhat as nostalgic views back into wine trends over the last 30 years, as well as information-rich vignettes. If you are truly into reading about wine, I highly recommend searching out these two books. A collection of Ms. Rosen’s humorous wine-related anecdotes, gleaned from her weekly column that appears in the Rocky Mountain News and Denver Post. Enjoyable, wry and informative. Auberon Waugh was the son of noted author Evelyn Waugh. Auberon was not known as a “wine writer,” primarily penning works of fiction in his early career. In his later years, he took to opining about many things as the Editor of the Literary Review, one of which was wine. Waugh on Wine is currently out of print and I found only one copy in Australia, which I waited 62 days to receive. As a true “wine geek,” I make it my business to read everything I can about wine. Waugh on Wine was interesting, at times funny and at other times sad. Overall, I found Mr. Waugh a little too opinionated and was in chronic disagreement with his views. Like many books from the past, Waugh on Wine is an interesting time capsule for the English “wine scene” of the early 1980’s. Wonderful story about the French winemakers and their battle to save France's national treasure from the Germans in World War II. Poignant and touching, yet filled with funny and amusing anecdotes, for me the book filled a gap in a period of the 20th century's most important eras. Like Cod, an engaging history of the mighty Sturgeon and its highly prized roe. Tons of interesting stories. Anyone who enjoys Champagne with Caviar should give this book a read. The companion to a previous recommended reading: Salt. Again, not a wine book, but a fascinating story about the history of the Cod fish (once so prevalent in the North Atlantic that early explorers remarked that you could almost walk to shore from your ship on their backs). Interesting and well written for the history buff. The follow-up to Mr. Steingarten's previous book: The Man Who Ate Everything. The current volume continues to showcase more of Mr. Steingarten's dry humor and oddly obsessive ways as the Food Critic of Vogue magazine. Entertaining and strangely informative. Detailed guide book to pairing wine with food. Some good information and certainly worth adding to the book shelf. However, the narrative is a bit dry and I found myself skimming more than reading. Not a wine book, but a fascinating account of humankind's history as it relates to salt. A must read for folks who enjoy history, especially "food" history, as well as those who enjoy learning about different cultures and their historical origins. Again, not a wine book, but Mr. Steingarten, the Food Critic for Vogue magazine writes some entertaining, at times hilarious prose about everything food. Marvelous with just enough satiric bite to keep things interesting and funny. Like Salt, a must read for any bona fide "foodie." If you are a “foody,” or you just enjoy a nice dinner out, then this short but insightful book is for you. Mr. Shaw goes behind the scenes to produce “an exploration and a celebration of the incredibly intricate workings of professional kitchens and dining rooms.” Mr. Shaw has a light style and comedic touch that reading this book fun and informative. Two fantastic references written by the Maitre Fromager of the Artisanal Cheese Center in New York (www.artisanalcheese.com). The Cheese Plate is Mr. McCalman’s first guide to fine cheese, while Cheese is his follow-up guide. Both books are expertly written and offer clear, concise information, including detailed guidelines for buying, aging and pairing cheeses. The photography is gorgeous – make sure you have plenty of delicious cheese around when you’re reading either book. An older "pocket guide" that I read many years ago. The book enters into more clinical or technique-oriented discussions around wine tasting, which I found valuable in developing my own wine tasting process. The style of the book itself is a bit dry and stiff, which for some may make absorbing the material tough. Technically excellent. Textbook for the WSET Diploma program. Good details on European wine regions/wines, somewhat light concerning the US and other New World areas. Only available from the WSET web site with shipping from the UK. Not your "traditional" wine guide, Ms. Immer embarks on an outline of her own method of teaching wine to the many waiters and waitresses at what was once the Windows on the World restaurant atop the WTC. A student of Kevin Zraly, Ms. Immer expands upon Mr. Zraly's simple approach to wine education. For me, I felt Ms. Immer over-simplified the subject too much. While there are some good points made in the book, I fundamentally disagree with Ms. Immer's "Big Six Grapes" concept, which is central to the methodology employed in the book. Ms Immer heaps accolades on Mr. Zraly, which is why his book is first on my list. The Sommelier’s Guide is a handy guide to wine from the perspective of a wine server. The book provides summary-level information that is intended as a primer to wine, from grape varieties, to regions, to wine service and tasting. Not a lot of ground-breaking information, but a well organized collection of data. To me this is the best "home" study wine course on the market. I bought the first edition back in 1987 and began touting it to friends even then. 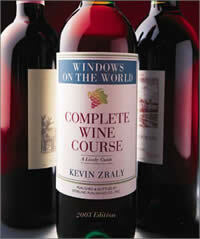 The approach used by Mr. Zraly is to simplify the process of learning about wine. Rather than write a tome, Mr. Zraly has distilled out the kernels of wisdom essential for a layperson to become comfortable with wine. At the same time, the detail and minutia are there, in the margins, if you desire a deeper study. Truly a book not to be missed. Another excellent "home" study course. Like the Windows on the World selection, the approach is to de-mystify wine and place the kernels of understanding out in front for all to see. The book also maintains the tongue-in-cheek style of the other "For Dummies" books which keeps it light. An excellent reference even for the self-avowed wine connoisseur. Wine Label Language is a great little book designed to take the mystery out of understanding wine bottle labels. Well-illustrated and well-annotated, Mr. Saunders provides ample information on wine labeling formats, laws and requirements. The Wine Report is a newly created annual collection of editorials arranged by country and region that provide significant insight into newsworthy trends, vintage information, most improved producers, as well as other detailed data. These books are not for the novice, but are an excellent reference for serious oenophiles. This book seriously appealed to the engineer in me. Lots of very technical information (including diagrams showing the chemical bonds for the elements that make up wine), but admittedly not for everyone. If you�re into the science of wine tasting, this book is a must have. An excellent primer on wine cellar "construction." I put the book to good use when I built my first, entirely passive wine cellar in my previous house. The directives and advice are sound. The book also is a good reference on wine storage in general. Highly recommended for anyone looking to "house" a wine collection correctly. When I was a little boy I was always fascinated by what appeared to be the mystery of wine making. My grandfather was a winemaker, although in his later years his misguided notions about barrel "seasoning" led to much more vinegar than fine or even palatable wine. My fascination took form in 1985 when I made my first case of red wine. Not bad and a whole lot of fun. The above three books are excellent guides to making wine and growing grapes (on a "home" scale); although the process really doesn't vary all that much when one scales-up their efforts. I also found these books to be valuable references in learning more about wine appreciation from the winemaker's perspective. The whole experience was actually invaluable to developing a deeper understanding of wine in general. Highly technical reference book that delves deeply into all segments of winemaking from grape growing to winemaking and aging. Excellent for someone wishing to make wines on their own. 1855: A History of Bordeaux Classification by Dewey Markham, Jr.
A rich, scholarly work that delves into the intricate history of wine’s most well-known classification. This book is a must read for anyone that fancies the wines of Bordeaux. Winner of the prestigious James Beard Award. Available only on Amazon. Another great reference book on grape varieties and their resultant wines. A serious tome to wine that is well written, easy to understand and quite informative. Because of the density of the material, the book makes a better reference than self-study guide. 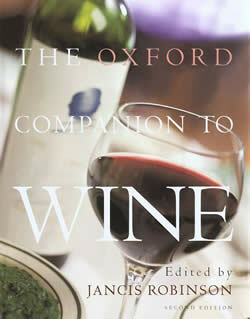 Mr. Broadbent is a prodigious taster and this book catalogs his fifty years of experience in the wine trade. A better reference for the collector than the student, the book is a veritable encyclopedia of tasting notes from every part of the world. Solid reference book with a more approachable style than the Oxford Companion. Highly recommended. The late Alexis Lichine was perhaps wine's greatest spokesperson. Mr. Lichine was known for his down-to-earth approach to wine, eschewing the snobbery of many of his peers in Bordeaux. I have been told many stories about people showing up at his chateau, unannounced, and being welcomed in and shown around by Mr. Lichine himself. Mr. Lichine's Encyclopedia is a wealth of knowledge, written in a simple style designed to make learning about wine fun and exciting. While dated and now out-of-print, the book stands as a tribute to one of wine's greatest champions. Highly recommended. Superb reference book by one of the world's foremost wine authorities. If it has even the remotest connection to wine, it's in the book. Not a book for "light reading," it is the ideal desk reference for the budding, or serious wine aficionado. Highly recommended. A lovely, entertaining look at the history of wine (from it�s earliest inceptions), written in an easy-to-read style, which is almost more novel than textbook. Another fine effort by Mr. Hugh Johnson. There are a lot of Bar Tending books on the market today, but this one is The Bible for any serious mixologist. The only problem is that it is out of print. However, searching on either Abebooks.com or Alibris.com should turn up inexpensive copies in good shape. The book is not just a collection of drink recipes, but rather an entertaining look at the Classic Cocktail. Originally published in 1948, the book has been passed down to generations of young men seeking how to mix that Classic Cocktail. Mr. Embury has a dry, entertaining style that makes for enjoyable reading. His drink recipes are without peer. Solid reference book with a glossy, pictorial feel. Recommended. Great pocket reference laid out in dictionary format. Tons of detailed information and references. Highly recommended. Well written reference books that provide some up-to-date information about three of the World’s most famous wine making countries. Beautiful photography and good maps. Mr. Peynaud has long been recognized as one of the most influential wine makers of the 20th century. This volume is a wonderful dissertation on the many aspects of wine appreciation. A must read for the serious connoisseur. Long considered to be the definitive volume cataloguing Italian wine regions. A beautiful book, unfortunately now out of print. If you can find a copy – BUY IT! Good, up-to-date reference book that approaches wine from the perspective of the grape variety. Very detailed and complete. Highly recommended. Excellent reference concerning the fine art of growing grapes and making wines. A mix of entertaining narrative and detailed technical information. Highly recommended. A great reference book filled with insightful explanations covering a wide range of subjects. From the chemical process of fermentation to regional overviews of the world's winemaking regions, Mr. Vine writes with clarity without being pedantic. I feel the book serves better as a reference than as a self-study guide primarily because it is more like a college textbook in both weight and breadth. Excellent. Burgundy, by Robert M. Parker, Jr. Most people who have even a passing interest in wine appreciation and collecting know Robert M. Parker, the lawyer-turned-oenophile who authored not only the above books, but also writes the well-known, well-respected wine ratings magazine The Wine Advocate. Mr. Parker is the champion of objectivity, as well as a tireless reviewer and researcher. His magazine is based on a subscription-only model (no advertising) to ensure the objectivity of the reviews. This same tenet comes through in his published books as well. All of the above are highly recommended for their depth of information, as well as the accompanying reviews of most of the important winemakers across the globe. One complaint, the print is often small and dense, making the reading difficult and slow going. While I don't always agree with Mr. Parker, I have the utmost respect for his knowledge, credibility and objectivity. While I have never met Hugh Johnson, I credit him with arousing my own passion for wine so fervently. I have the 2nd Edition, as well as the 5th Edition of this work and it is a superb reference for anyone wanting to further their understanding of wine. Ms. Robinson is really the writer in the 5th Edition, and while I don't find her quite as engaging as Mr. Johnson, the book is chock full of regional details. The fact that the book is an atlas means that the entire format is built around the mapping of the world's wine regions. For me, understanding the "geography" of wine is tantamount to wine appreciation. A must have reference. Perhaps the best video series on wine, a combination of history class and worldwide travelogue, hosted by one of the most dynamic wine personalities alive, Hugh Johnson. The tapes are out-of-print but well worth searching for, they make the process of learning about wine's long past fun and engaging. Mr. Johnson's personality and unique brand of humor are not to be missed.